Happy 25th Anniversary of Transradial Access! https://www.merit.com/wp-content/uploads/2017/08/25thTR_Anniversary_mbl.jpg 415 600 Merit Medical https://www.merit.com/wp-content/uploads/2018/11/merit-header-logo.svg Merit Medical2017-08-24 17:10:512018-07-16 16:52:10Happy 25th Anniversary of Transradial Access! Navigating through difficult vascular anatomy can be challenging, and finding just the right guide wire to do so can be even more difficult. Ultimately, clinicians need a wire that is reliable and that can get them to their destination within the vasculature, even if the path is a tortuous one. Look no further, because the new InQwire Amplatz guide wire was designed to do just that. A firm inner core, a smooth transition and a lubricous coating are key elements for reliable guide wire navigation. With those elements in mind, the InQwire Amplatz wire was carefully designed to be a tool for precision, agility, and strength. The wire’s firm construction provides an increased level of stiffness that delivers extra support and stability within the vasculature, specifically for enhanced navigation. A flat outer wire coil allows a larger inner core to provide added stiffness which facilitates catheter placement and advancement of other devices, such as dilatation catheters and stent catheters during contralateral access. A smooth tapered transition from the shaft to the flexible tip, allows atraumatic negotiation of the most difficult vascular anatomy. A proprietary outer coating was added to the entire surface of the wire to facilitate smooth navigation with less resistance against vessel walls. In testing the wire’s performance against the leading competitor, the InQwire Amplatz proved to be superior and was documented as having a 20% higher lubricity rating*. 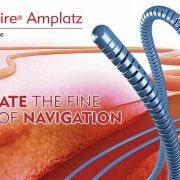 The Merit InQwire Amplatz wire requires considerably lower force per grams, therefore allowing catheters to move more easily over the wire. The InQwire Amplatz is compatible with 0.035” & 0.038” devices and for added convenience the Amplatz wires are available in multiple tip configurations to include straight-tip wires in a variety of flexible profiles including 1.0cm, 3.5cm, 4.0cm, 6cm, and 7cm. A J3mm tip configuration is also available. For additional information visit Merit.com/Amplatz or contact your local Merit representative. An important part of Merit Medical’s business involves working with Group Purchasing Organizations and Integrated Delivery Networks around the United States. 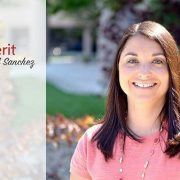 April Sanchez, Merit’s Supervisor of Strategic Accounts Contract Management, speaks about her team’s role to provide important financial impact and analysis of Merit’s contracts with these GPOs and IDNs. 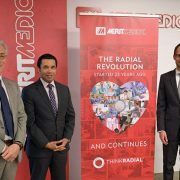 The efforts of Strategic Accounts allows Merit to form lasting relationships with customers and provides them with access to products to improve and save the lives of their patients. Why Use a Closed-Flush Blood Sampling System? A critically ill patient may enter the ICU because of organ failure, extreme dehydration, Sepsis, or some other complicated issue. In all of these conditions, a quick response is best for a positive patient outcome. Invasive hemodynamic monitoring allows a healthcare provider to access real-time information about the patient’s cardiac health. Additionally, blood samples are a routine and vital process to assess the patient’s lung function and perfusion. Multiple blood samples per day is not uncommon in the ICU; however, providers may be unaware of the inherent risks of drawing blood. Merit Medical is proud to offer a portfolio of critical care products including invasive hemodynamic monitoring sets. 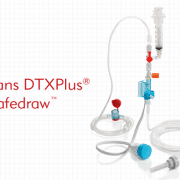 The MeritransDTXPlus® with Safedraw® closed arterial sampling helps minimize the risk of infection and unnecessary exposure with a simple, closed, in-line arterial sampling system. Unlike other pressure monitoring systems, the EasyVent™ closed zero port allows clinicians to maintain a closed system when priming or zeroing the transducer (not opening the system to the ambient environment reduces patient risk and enhances overall safety). A new critical care catalog and a brochure are available showing Merit’s critical care portfolio. Oto J, Nakataki E, Hata M, Tsunano Y, Okuda N, Imanaka H, Nishimura M. (2012 Aug). Comparison of bacterial contamination of blood conservation system and stopcock system arterial sampling lines used in critically ill patients. Am J Infect Control, 40(6):530-4. doi: 10.1016/j.ajic.2011.08.006. Epub2011 Nov 3. Rezende E, Ferez MA, Silva Junior JM, Oliveira AM, Viana RA, Mendes CL, Toledo Dde O, Ribeiro Neto MC, Setoyama TA. (2010 Mar). Closed system for blood sampling and transfusion in critically ill patients. Rev Bras Ter Intensiva, 22(1):5-10.
https://www.merit.com/wp-content/uploads/2017/08/DTXPlus_Blog.png 335 600 Merit Medical https://www.merit.com/wp-content/uploads/2018/11/merit-header-logo.svg Merit Medical2017-08-17 14:10:392018-06-19 19:22:24Why Use a Closed-Flush Blood Sampling System? Endovascular aneurysm repair (EVAR) has been linked to the formation of type II endoleaks. The transarterial iliolumbar approach to repair this complication is occasionally difficult and associated with a lower technical success rate due to the anatomical features of the area. However, earlier this year Dr. Yunosuke Nishihara of Saga-Ken Medical Centre Koseikan in Saga, Japan, discussed two cases in which the SwiftNINJA® Steerable Microcatheter successfully embolized type II endoleaks using the iliolumbar artery approach after attempts employing other microcatheters and conventional catheterization techniques had failed. EVAR was performed in January 2014, immediately followed by a persistent type II endoleak and increased diameter of the aneurysm. Transfemoral transarterial embolization was attempted in March 2015 but failed because selection of the iliolumbar artery and beyond was not possible. At follow up, the aneurysm size was 15 mm greater than the previous year. Transarterial iliolumbar embolization using the SwiftNINJA was performed in March 2016. The SwiftNINJA was articulated to cannulate a strong angle bifurcation. Locking and unlocking the tip of the SwiftNINJA at an angle along the bifurcation allowed for easy vessel selection and advancing of the guidewire. After exchanging the catheter, the tip of the selective microcatheter was guided into the aneurysm sac; the endoleak cavity and feeding artery were embolized. After embolization, no blood flow into the endoleak cavity was observed. EVAR was performed in January 2014, immediately followed by a persistent type II endoleak. The aneurysm size was 8 mm greater than the previous year and the patient was admitted in March 2016 to undergo embolization via the transarterial iliolumbar approach using the SwiftNINJA. The SwiftNINJA was the primary microcatheter used to cannulate the aneurysm and was guided to the bifurcation without a guidewire. A guidewire was then successfully placed into the aneurysms feeding vessel and the SwiftNINJA was introduced successfully. After exchanging the catheter, the tip of the selective microcatheter was guided into the endoleak cavity. The endoleak cavity was embolized and coil embolization was performed successfully on suspected feeding and/or outflow vessels. Despite the complexities surrounding the transarterial iliolumbar approach, the author noted that the SwiftNINJA improved the selectivity of target vessels and provided enough support for guidewire introduction into acute bifurcating vessels to not allow catheter kickback. These device advantages can lead to other patient and clinician benefits. 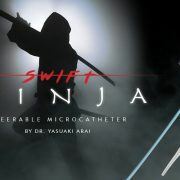 Merit Medical’s SwiftNINJA® Steerable Microcatheter is the single most advanced and only 180-degree articulating microcatheter on the market. 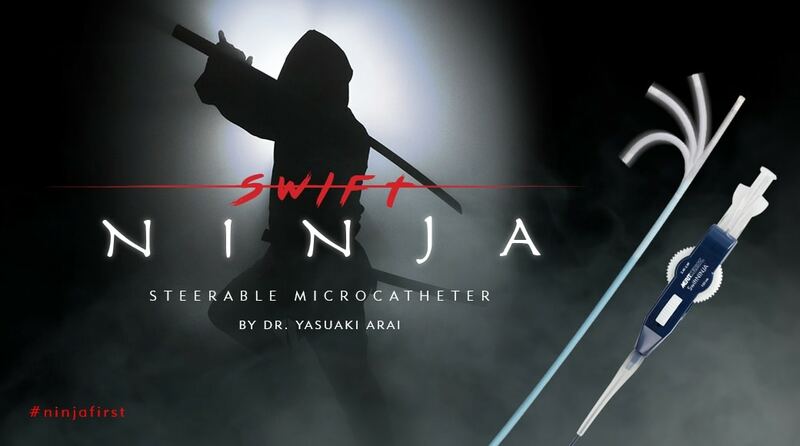 Able to navigate difficult vasculature, the SwiftNINJA offers unparalleled performance by utilizing three main advantages: speed, control, and delivery. Nishihara, Y. (2017). 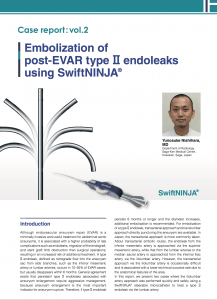 Embolization of post-EVAR type II endoleaks using SwiftNINJA® [White paper]. Sumitomo Bakelite Co., LTD., Tokyo, Japan: Medical Products Business Division. Dr. Yunosuke Nishihara received payment from Sumitomo Bakelite Co., Ltd. for the performance of this study. 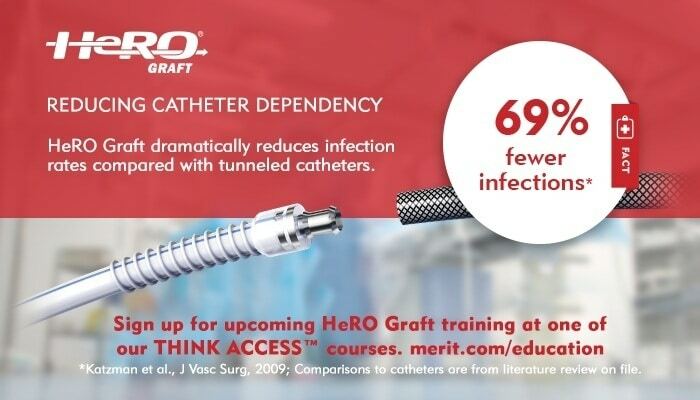 Unlike other graft devices, HeRO Graft technology improves long-term hemodialysis by way of a Venous Outflow component that’s placed in the right atrium, which then attaches to an adjacent ePTFE hemodialysis graft via a proprietary titanium connector. This mechanism allows for blood to return from an artery back to the heart, bypassing central venous occlusions—a common complication seen among catheter-dependent long-term dialysis patients. In an effort to circumvent the 2-4 week bridging period and avoid this risk of infection, Merit launched the Super HeRO™ Adapter in 2016. Made with the same HeRO Graft technology, the Super HeRO Adapter has the advantage of wide range graft compatibility. 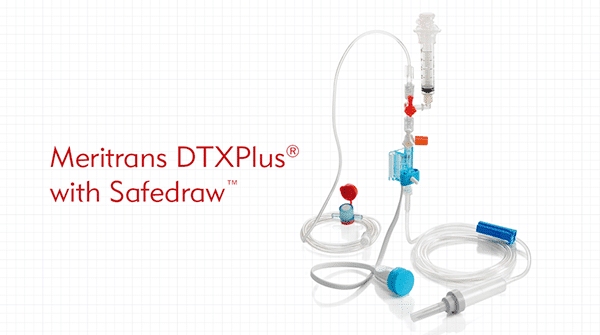 In this instance, by connecting the Super HeRO Adapter to a compatible early cannulation graft, a patient can be implanted today and dialyzed the next, virtually eliminating the risk of access-related infection due to a bridging catheter. The Super HeRO Adapter is also designed for long-term, access-challenged hemodialysis patients who still have a working Venous Outflow component but need a new graft. Available through the HeRO Ally™ Revision Kit, this option provides clinicians with the tools they need to replace an old graft with a compatible graft of their choice. In order to meet the diverse needs of patients, dialysis technology is continuously evolving. By taking advantage of innovative tools, clinicians can improve the dialysis experience for catheter-dependent patients, offering them better treatment and a new outlook on life. 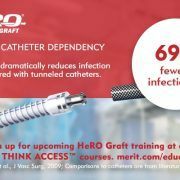 As an option to help improve patient care and save on healthcare related costs, Merit Medical offers an in-depth, hands-on training course – THINK ACCESS – that covers techniques for HeRO graft implantation. 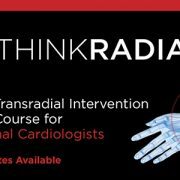 To be considered for an upcoming THINK ACCESS course, visit the link below to sign-up. Clin J Am Soc Nephrol. 2011;6: 2247-52. J Vasc Surg. 2009;50: 600-607. J Surg Res. 2012;177: 165-171.